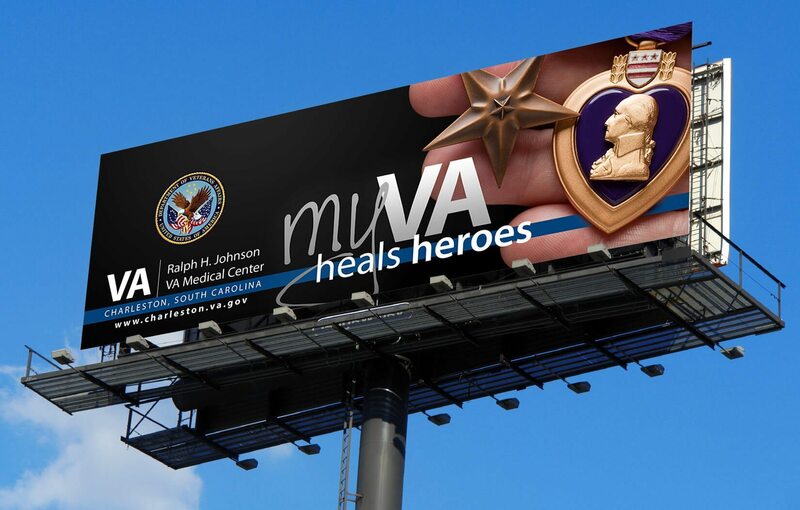 The Ralph H. Johnson VAMC has been fortunate to be able to use billboard advertising for a number of years; however, previous efforts were not as effective as desired and looked dated in comparison to the other healthcare advertisers in the region. The Stakeholder Relations team sought a modern campaign that would connect with Veterans and improve social perception of the VA as a high-quality, modern healthcare provider. Ten sets of billboards depicting patients juxtaposed with their providers were developed covering a wide range of Veteran healthcare concerns including homelessness, cancer care and PTSD, among others. These billboards were changed roughly every six weeks in various locations throughout Charleston, Myrtle Beach and Savannah during Fiscal Year 2015. The team brainstormed for some time and determined that we needed something more than just new graphics for billboards. We needed a short tag-line that was instantly recognizable and could be used with a variety of mediums and decided on “myVA” as it invited both Veterans and staff to connect with and feel ownership of their local facility. myVA turned into a comprehensive branding campaign for the medical center starting with the billboards of Veterans and providers with statements about what VA is for each of them and expanded to include that year’s annual report and a rebranding of the facility’s quarterly magazine. The marketing campaign was exceptionally well received within the community and by VA leadership. The campaign especially impressed the then Interim Undersecretary for Health Care Dr. Clancy upon her arrival in Charleston. She took the “myVA” concept back to Secretary McDonald and it has since been implemented throughout the VA system. With the posting of our first billboard in the series, we also debuted the redesign and rebranding of the facility’s quarterly magazine.